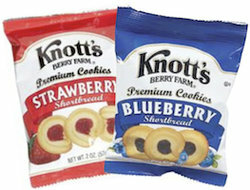 Knott's Berry Farm Cookie Packs (2 oz). Wonderful little shortbread cookies with Knott's Berry Farm Fruit Centers. Three flavors to choose from, all of which have their own unique taste. Everyone seems to have their favorite, which one will you choose?